The rear seat for the ATR is designed for patient care while in transport back to the awaiting ambulance. It features durable square tube frame with a positive stop footrest, seatbelt and three different locations to adjust how close you sit to the stokes litter. Seat available in the following colors: Black (Std. ), Grey and Yellow. The medical tray is made from 18 ga. steel and powder coat painted with cinching straps to hold your medical equipment to the tray. It attaches to the ATR via the tubes that slip over the front uprights and attaches securely to the trailer via the 2 inch web strap. 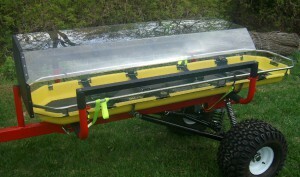 Shown here is the optional 2 ft. x 7 ft. aluminum equipment tub for carrying anything you'll need to just about anywhere. During brush fires you can carry Indian guns, brooms, shovels to where you need it. Our Universal Patient Cover for the All Terrain Res-Q trailers is now available. Attaches to the ATR trailer by 4 points by an aluminum tube that slips over the litter supports. 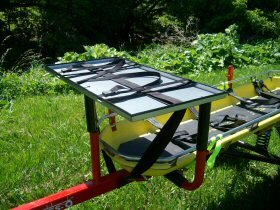 The full lexan cover protects the patient from flying debris when in transport. Got snow? Well we have the answer for going out onto the trails with our trailer in tow. 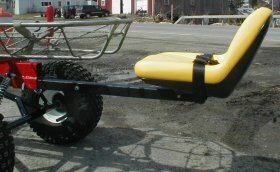 The ski package is for those who are towing the All Terrain Res-Q trailer behind a snowmobile/ATV out on packed trails. With the ease of changing a tire, you can mount the skis to any ATR trailer. Please note that for the best performance and safety, it is recommended that you stay onto a packed trail when towing behind a snowmobile. Adjustments may be necessary to the suspension when using the skis on a hard packed surface. 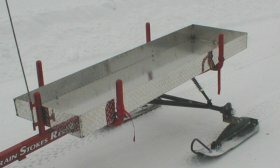 Snowmobile hitch for the ATR is constructed to be used when towing with a snowmobile. 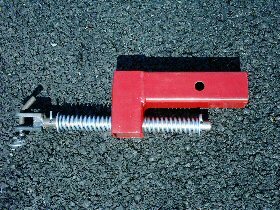 As hitches on snowmobiles utilize a smaller pin for towing trailers we have designed this hitch to alleviate that problem. With springs on either end to cushion the shock from snowmobiles taking off from a complete stop. To install this hitch into any of the ATR trailers, just remove the hitch pin in the coupler, pull the hitch out and insert the snowmobile hitch in it's place. 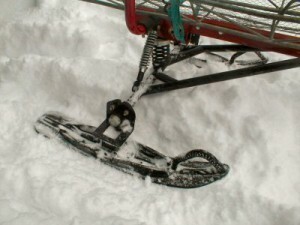 The front wheel is constructed to take the abuse. Using this option, you can maneuver by hand to get thru factories, large warehouses and the like. With very little effort you can push the trailer from the rear and the large 10 in. front wheel rolls smoothly over most obstacles. Features full 360 degree swivel, dual grease fittings (1 on swivel, 1 on wheel), 10 in. 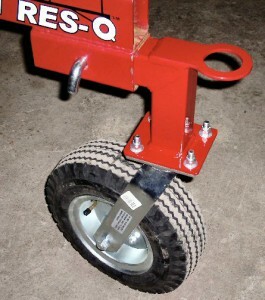 pneumatic rubber tire, towing ring for lowering and retrieving over embankment. Together with the All Terrain Res-Q™ trailer you find the perfect solution for back country fire suppression along with providing a faster means of fire knockdown. CAFS systems provides lighter and more manageable hose lines because they are typically half the weight and longer hose lays are possible due to limited friction loss in a CAFS line. With that, firefighter fatigue is greatly reduced from using the heavier and higher pressure hose lines. Other advantages of CAFS systems include protection of exposures, preservation of evidence, faster cleanup because of the soap residue, and it has an extremely limited runoff quality resulting in a more environmentally friendly control of contamination. When used with the All Terrain Res-Q™ trailer, the result is a faster deployment of suppression capabilities while reducing the manpower needed to contain the fire. Unit comes complete with one air cylinder and a plastic storage box that contains 2 - 16 oz. plastic bottles for foam concentrate and a cylinder wrench. Spare bottle and mount shown in picture is extra. Yellow high-density polyethylene shell (Also available in Red), supported by a stainless steel outer rail, permanently attached with stainless steel semi-tubular rivets. Features molded runners, fully exposed outer rail, non-absorbent foam pad secured to stretcher and four patient restraint straps. Ideal for unusually rugged rescue situations such as industrial, mining or construction. Patent Pending. DIMENSIONS: 84 1/2" L; 24" W; 7 1/2"
Nylon web straps at chest, abdomen, thigh, and calf. Adjustable footrests for vertical lifting. Frame is 5/8" steel tubing; cross braces and runners 3/16" x 3/4" flat steel. Basket is 18 gauge, 1" hexagon mesh netting with gray plastisol coating to make it rust proof. Straps are included, without leg divider. DIMENSIONS: 82" L; 8-1/2" H.
Four nylon patient restrainer straps are standard equipment on full length and folding models. Two straps on the half length. DIMENSIONS: FOLDED 37-1/4" L X 16" W X 3" THICK | UNFOLDED 74-1/4" L X 16" W X 1-3/4" THICK CAPACITY: 375LBS.